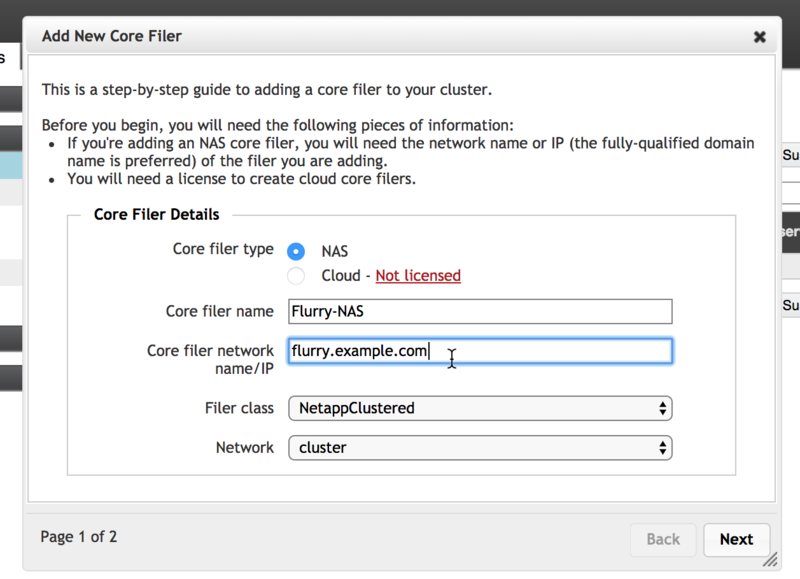 A core filer is the entity that links a backend storage system (for example, a NAS hardware appliance or a cloud object store) to the Avere cluster. Use the Avere Control Panel to add a core filer to your system. For additional information about choosing and preparing to add a core filer, read Working With Core Filers. After adding a core filer, you can view or modify its properties by using the Core Filer Details settings page. 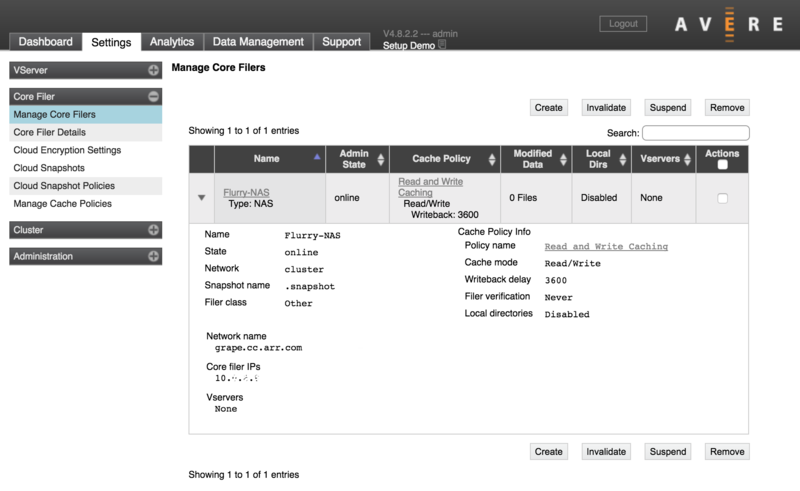 Define a core filer by clicking the Create button on the Core Filer > Manage Core Filers settings page. The Add New Core Filer wizard walks you through the process of creating a core filer that links to your backend storage. The Cluster Configuration Guide has very detailed descriptions of the process, which is different for NFS/NAS storage and for cloud storage. The options might be restricted based on what licenses you have installed. The screenshot below is from a cluster that does not have a FlashCloud license installed. 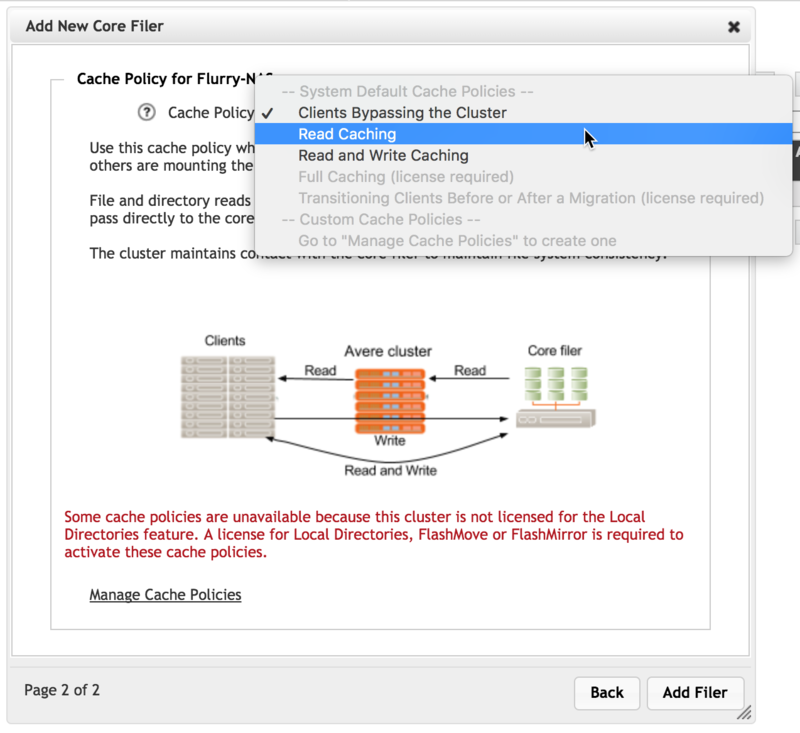 On the second page of the wizard you must select a cache policy for the new core filer. These are described in detail in the Cluster Configuration Guide. Policies that require additional licenses cannot be selected. After filling in all of the required settings in the Add New Core Filer wizard, click the Add Filer button to submit the change. After a few moments, the storage system appears on the Dashboard’s core filers list and can be accessed through core filer settings pages. Note that this screenshot shows a core filer with no vserver - its setup is not complete. You must associate the core filer with a vserver to allow clients to access the storage system. Read Configuring VServers and Global Namespace for help with the next step. The Local Directories feature in Avere OS provides enhanced caching services, which can impact the cluster’s throughput in some scenarios. Avere Systems recommends that customers consult their Avere representatives before enabling this feature. Some caching scenarios require the Local Directories feature, so some cache policies are unavailable until after you have obtained and installed a Local Directories license file. There is no additional charge for the license. Contact Avere Global Services if you have questions. If you add a cloud object store as a core filer, you must specify the cloud service and credentials for accessing the storage, among other parameters. 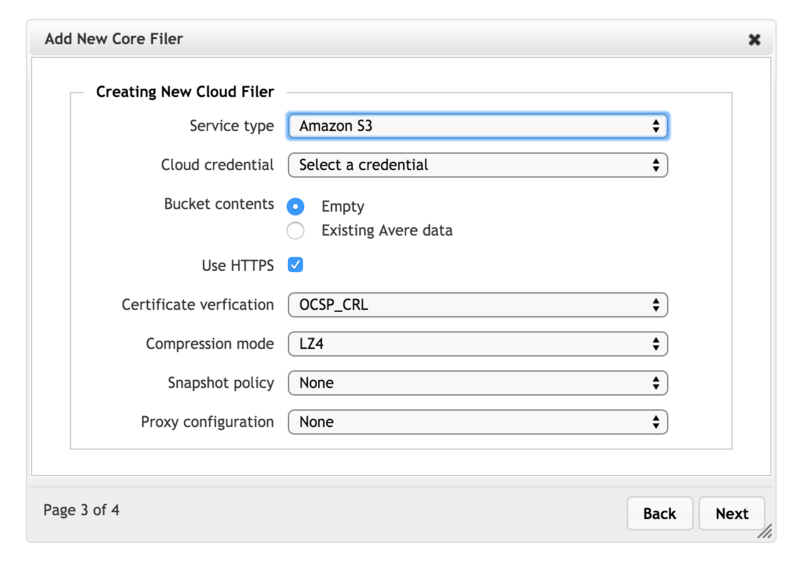 You can add a cloud storage credential as part of creating the core filer. If you later want to add, change or remove a credential, use the Cluster > Cloud Credentials settings page. For more details, read the Cluster > Cloud Credentials chapter in the Cluster Configuration Guide, and the Cloud Service and Protocol section of the chapter that describes the cloud core filer wizard.